We’ve all been there…grease splatters in the microwave, food explosions on the stove…luckily the solution to these common kitchen problems is as easy as overcooking your rice. HELP!! 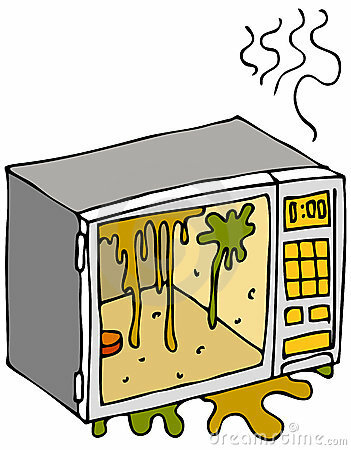 THERE’S GREASE ALL OVER THE MICROWAVE FROM HEATING UP LAST NIGHT’S CASSEROLE! Not to worry. Bust out a package of powdered drink mix (like Kool-Aid) with 2 quarts water. Let it sit for 10 minutes and then wipe down the microwave with the rough side of a sponge. Look for mixes that include citric acid, which is a grease fighting super hero. HELP!! I USED MY COFFEE GRINDER TO BLEND SOME SPICES FOR DINNER LAST NIGHT AND NOW IT REEKS OF GARLIC! I NEED MY COFFEE NOW! Okay, just calm down. Grab a handful of Cheerios and grind them up in the machine for about 30 seconds. You could also place a charcoal briquette in the grinder and cover it with a paper bag. Let it sit overnight so the porous surface of the charcoal can swallow the smell-causing agents. HELP!! MY DINNER IS STILL STUCK TO THE CAST IRON PAN! For a quick clean up, fill the pan with water, bring it to a boil, simmer for 15 minutes, and then drain, coaxing off any stubborn food with a wooden spoon or silicone spatula. You could also coat the pan with vegetable oil and let it work its magic overnight. Mop up the mess/oil with paper towels or a clean cloth. HELP!! I BURNED THE RICE AT THE BOTTOM OF THE POT! Simply fill the pan with hot water and toss in a fabric softening dryer sheet and let it sit overnight. The softening agents in the sheet will help the rice separate from the pan. HELP!! MY CUTTING BOARD REEKS OF ONIONS! Not to worry. Sprinkle some mustard powder on a wet board and rub it in with a sponge before washing it as normal. Mustard is an awesome odor eater. Yellow mustard can help remove the garlic smell from jars, too. If you purchase pre-chopped garlic and want to recycle the jar, just place about 1 tablespoon of yellow mustard in the jar and fill with hot water. Stir/shake for 30-60 seconds and then rinse it clean.